U.S. Supreme Court Justice Sonia Sotomayor talks to a young fan at a recent book signing and lecture at the Harold Washington Library. Photo by Mary C. Piemonte. The book covers her transition from her early life growing up in New York City to becoming a judge on the country’s highest federal bench. Early life in public housing was not easy, she said to the audience in the jam-packed auditorium at the downtown Harold Washington Library last month. However, her role models, including her mother, and her perseverance in the face of obstacles to her life’s goals allowed her to gain success and become the first Latina and third woman appointed to the U.S. Supreme Court. 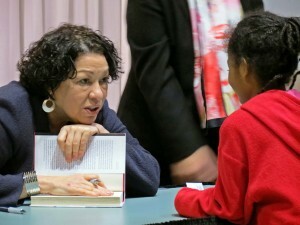 “Growing up a juvenile diabetic with an alcoholic father, in an era where things like that were kept hidden, where poverty was something that was perceived as shameful, where being a Latina in situations where I had been made to feel uncomfortable,” was very hard, Sotomayor said.